Alpro vanilla can add a rich but subtle taste to your breakfast or why not reach for it when you need a sweet fix on its own or with your own personal touch. Alpro is a tasty choice if you love yogurts, made with no animal fats, just tasty plant goodness with calcium, vitamin D and yogurt cultures. Eat well- feel uplifted. Soya with yogurt cultures. Source of plant protein. Naturally low in fat. Free from dairy, gluten and wheat. 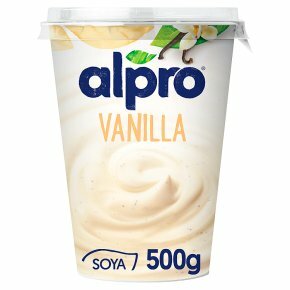 Proterra certified - sustainability non-GMO soya.Alpro®Vanilla. Enjoy this plant-based alternative to yogurt with cereals, fruits or on its own. Eat well, feel uplifted.